Hi everyone! I was very kindly tagged by the wonderful Erika @ Erika In Bookventureland to do this challenge, thank you Erika! 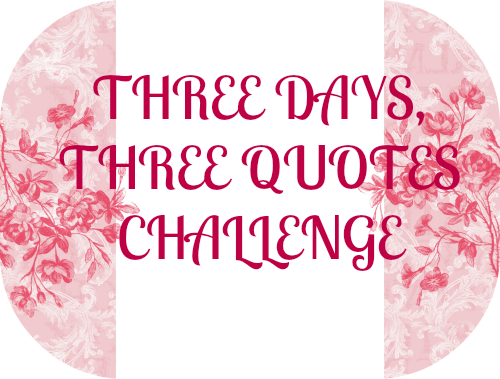 So for each of the three days (starting with this post) I will be posting a quote a day from three of my favourite books! Since I am still relatively new here and a lot of people have already taken part in this challenge I have decided to simply tag one person per day. So, the quote I have picked for today is from the novel that I am currently re-reading (and loving) and the reason I picked it can be summed up in one word – Sass! OOOOH, THE SASS! This is literally one of my favourite quotes from the entire series! I hope you enjoyed day one of this challenge. I can see why you picked that, it’s the kind of lip that would have got me into sooo much trouble at school! Haha, yeah! Well it got Harry a detention with Snape! I always found some teachers never had a sense of humour. Just like snape.